Oil on canvas, 57 x 71 cm. In 1831, Sonne received a stipend of 500 rixdollars to travel to Italy. He ended up staying in Rome for nearly ten years, where he primarily produced genre paintings of Italian peasant life. 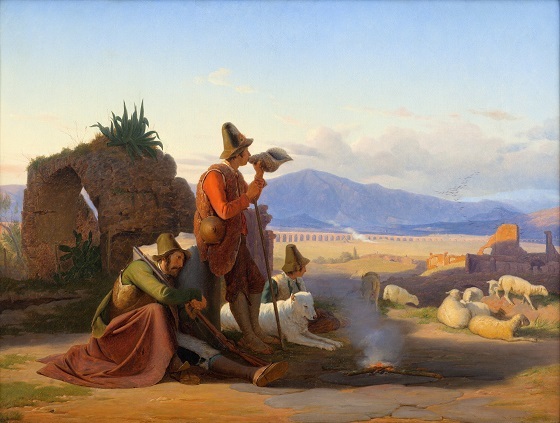 The Campagna was an inexhaustible source of aesthetic pleasure for artists and poets. For outsiders, peasant life and the landscape were picturesque as portrayed in genre art, but the life of shepherds and peasants was difficult, toilsome and unromantic. The setting evening sun casts a warm, golden light across the landscape in Sonne’s aesthetic depiction of three shepherds with their dogs and flock of sheep. The group is carefully positioned in a harmonious pattern where the stylised figures form a monumental triangle in the foreground.